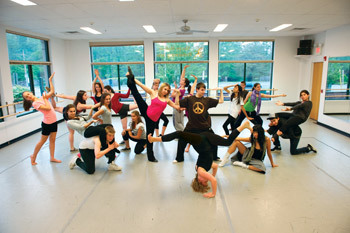 Sleepy Hollow Performing Artists is now called Westchester Dance Artists! WDA presented four new works at Symphony Space in NYC as part of Artistic Dance Exchange competition and convention. ​Our dances were hits, winning the highest marks in their categories, as well as the "Most Entertaining Dance" award for Albert Guerzon's "If You Dare". Winner of the Prestigious "Arts Award"
Sleepy Hollow Performing Artists is the proud recipient of the Westchester Arts Council's most prestigious award, recognizing an organization whose vision, commitment, and leadership enrich Westchester, its communities, and its citizens. Aug. 2015 Sleepy Hollow Performing Artists is so grateful for those who made our first ever fundraiser - Broadway, North Broadway! a tremendous success! In addition to appearances by our own company, we were privileged to have performances by Ester Barrosa (pictured) who sang a song from her lead role as "Kim" in Miss Saigon; Blake Whyte (Credits include "Fiero" from Wicked), who sang an original work; Michelle Dawson (Mama Mia) singing "The Winner Takes It All" from Mama Mia; and the incredible Jimmy Tate, who tapped and sang his own work! Thank you to all those who attended for helping to make the night a wild success! There’s Clara, and the Sugar Plum Fairy, and dancing snowflakes, break dancers, unicyclers, Brittany Spears, Dora the Explorer and…say what? That’s right—all those characters appear in The Sleepy Hollow Performing Arts Center’s version of “The Nutcracker”—here dubbed “Nutcracker Now 2008”—which opens tonight (Dec. 12) at the Irvington Town Hall Theater and continues with two show tomorrow.